Unbelievably, I’m yet to explore the continent of Asia at all. Somehow I feel like I might be saving the best for last! From scuba diving the Philippines to yoga in India, from trekking in Nepal to exploring the temples of Cambodia, I can’t wait to explore the length and breadth of this diverse part of the world. But there’s one spot that calls to me more than almost any other country in Asia and that’s Indonesia. Perhaps because it’s so close to Australia, perhaps it’s because I’ve heard so much about it, or perhaps it’s just the seemingly endless number of islands that have me all wrapped up! 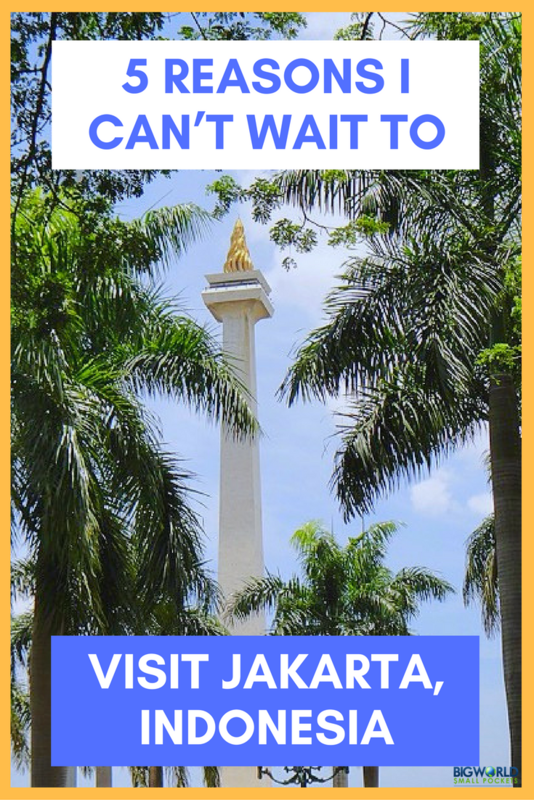 Whatever the reason, I’m pretty sure Indonesia will be my first step into the great continent of Asia and so, looking ahead to my most likely point of arrival, here’s 5 reasons I can’t wait to visit Jakarta, Indonesia. When I think of Asia, I can’t help but think of markets – one of my favourite travel experiences the world over! Soaking in the sights, smells and sounds of these bustling places always draws me into a country and that why I’m really looking forward to checking out Lenggang when I visit Jakarta. With over 300 different vendors, most of them formerly illegal street traders, a visit to Lenggang seems like a great way to support local small businesses. It also looks like an awesome way to try a range of food from across Indonesia, with various dishes from many of the different islands all available along with long communal tables, where you can enjoy a feast whilst interacting with the locals. I’m a big fan of history and always love to discover the heritage and past stories of any country I visit. I feel this can often better help me understand the culture of a different place, getting a deeper knowledge of its past and its people. 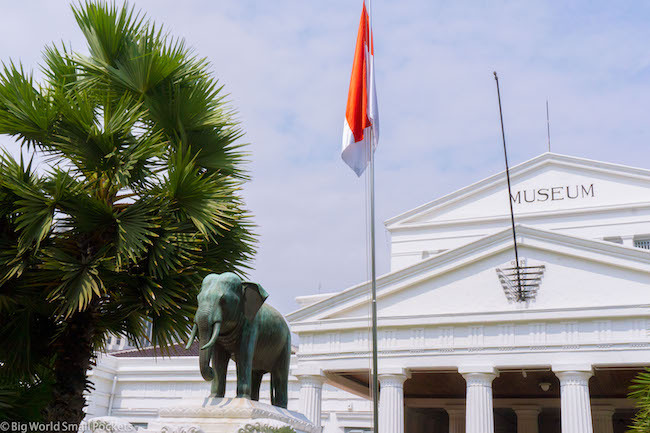 Indonesia, with its rich and complex history, is no exception and I can’t wait to explore the country’s National Museum when I visit Jakarta. Located in the centre of the capital, this great collection of archeological and anthropological artifacts is meant to be one of the best in the whole of Southeast Asia. Among the treasures are a great prehistoric collection, an interesting-looking stone sculpture collection and of course, the famous elephant statue in the entrance way, by which the museum is often referred to. Apparently, there are over 140 Chinese Temples in Jakarta, but the oldest and most famous is the Jin De Yuan, dating from 1755. This is a Chinese Buddhist temple, where many people still go to pay homage to the gods, and the fascinating mix of culture it embodies fascinates me. The building itself also looks incredible with a roof crowned by two dragons eating pearls. Inside the place is filled with red pillars & candles, Buddhist statues and some beautiful calligraphy. With my keen interest in Buddhism, this is definitely one of the top places I want to explore when I visit Jakarta. Often nicknamed the Tropical Amsterdam, or the Old Town, Kota Tua is a historical part of Jakarta built during the Dutch colonial period. 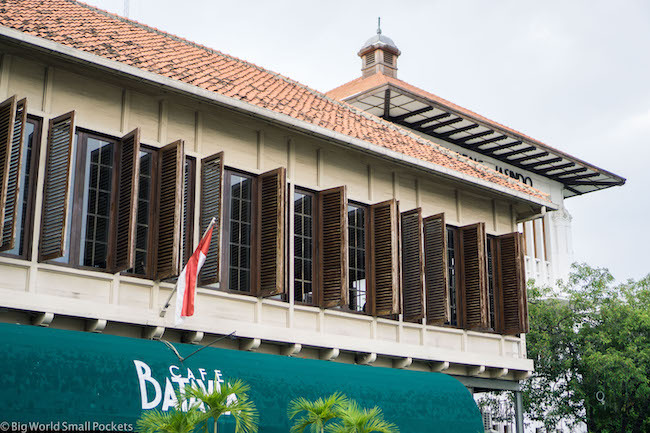 Still displaying some old colonial buildings, the Jembatan Kota Intan (Diamond City Bridge) and the Café Batavia are 2 of the area’s most famous attractions, which I look forward to seeing. 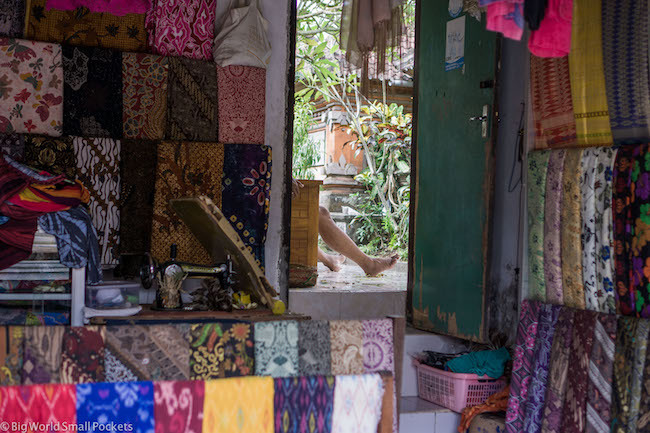 There’s also some small museums that seemed to have popped up in this part of Jakarta I want to check out, but most of all I love exploring the slightly forgotten parts of cities and the unearthing the stories that lie within their crumbling walls. 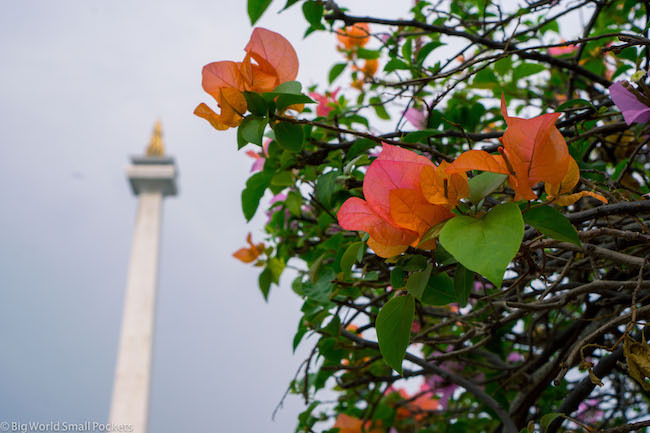 This huge monument celebrates Indonesian Independence and climbing to the top of it to take in the city view is one of the things I’m looking forward to visiting most in Jakarta. Learning more about the recent and political history of this diverse country also inspries me and I’ve heard that there’s some great people-watching opps around the monument too! And when I do visit Jakarta, I already know where I plan to stay. The Fave Hotel Jakarta gets some great reviews and is perfectly priced for us budget travellers. It’s also very well located, and with free wifi and clean, modern facilities has everything I need to get my Asia trip off to a great start. So why not make your hotel booking for the Fave Hotel Jakarta too? Hope you are going to have a heart shattering experiences on your visit to jakarta. Dont forget to sample our mouthwatering local food. Awesome list for Indonesia! I’ll hopefully be there for my first time in January and I’m so looking forward to it!! I hadn’t seen any photos of the Puncak Highlands. It looks amazing! Indo is amazing. I love it there. The food, the people, the culture, the beaches. I hope to go back soon. Oh, I can’t believe that Indonesia has such a cool highland like Cameron in Malaysia. I’m so glad to know that. Thanks so much for the informative post!